"Get killer sounding guitar tracks at home with the gear you already have!" This is guitar recording and mixing made simple. This is REthink Guitar. I tried miking up my amp yesterday according to what I learned from REthink Guitar. And … BOY … does it sound good! Really better than my previous attempts with the Line6 POD (which I already thought to be great). OK I bought your video series REthink Guitar. Graham you are amazing. thanks so much. I stayed up all night because I didn’t have to work today just to watch all of them and try out the techniques. I like that ear perspective for acoustic guitar. That one video alone really helped and opened my eyes. No more boomy guitar for me. Thanks. 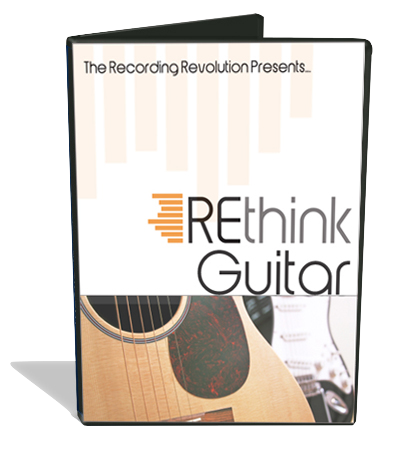 "With what you’ll learn in REthink Guitar, if you have a single $100 microphone lying around you already own everything you need to get pro sounding guitar tracks!" If you are not completely impressed with REthink Guitar, let us know within the first 60 days and we'll give you all your money back. If you're not happy, you don't pay. Signing up for REthink Guitar is quick... Within minutes you'll see how easy it is to get killer sounding acoustic and electric guitar tracks in your home studio. With the 60-day no risk money back guarantee, it is a no-brainer. Sign up now!